Close your eyes and feel the whistling winds as you feel the magical flight of the gibbon at Khao Kheow Open Zoo. 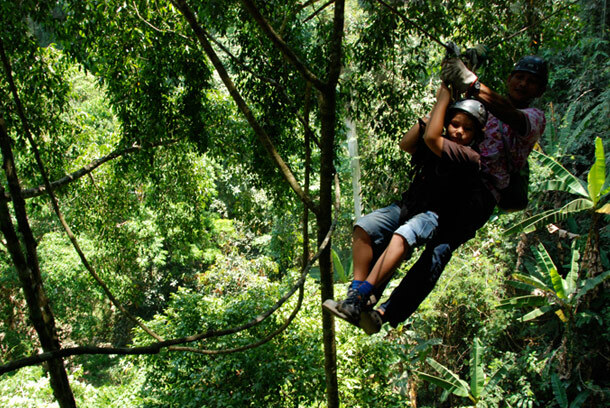 Journey to the jungle is where fun meets excitement in multiple ways. Give a try to the Adventurous Zipline Tour Thailand and let your senses overcome those unknown fears. This is the beauty of Thailand which globally recognized because it gives fair chance to visitors to enjoy mesmerizing Zipline around lush green forest. Our tours are not just delight for wildlife enthusiast but also for those who prefer adventure and thrills of swinging from Zipline wires from one-corner-to-another. 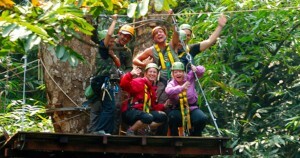 We offer three hours of canopy adventure, Thai lunch/dinner and an hour of jungle trekking. This is not it; there are quick fun-facts and trivia from our highly experienced guide about Zipline Tour Thailand. Certain criteria that fulfil the eligibility for flight of the gibbon tour such as minimum height of the guest should be 3 feet (100 cm.) And weight of guests must not exceed 130 kilograms. Certain dos and don’ts include – to wear long pants, polo T-shirt and sports shoes. Guests are requested to avoid the use of excessive jewelry, backpack, sunglasses and all other unnecessary items.